Cascina Abelloni, Langhe Hills at 5 min from Alba. Property 52: Cascina Abelloni, Langhe Hills at 5 min from Alba. Property 56: Welcome to La Crota, B & B just minutes from Asti! Panoramic house overlooking the vineyards between Nizza Monferrato and Acquiterme. Property 62: Panoramic house overlooking the vineyards between Nizza Monferrato and Acquiterme. Cascina Grace. Farmhouse on the Monferrato Hills. 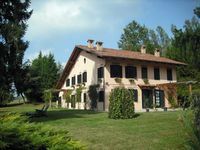 Property 70: Cascina Grace. Farmhouse on the Monferrato Hills. White Truffle, Wine, Seclusion, Space And Charm! Bring Your Horses And Pets!! Property 75: White Truffle, Wine, Seclusion, Space And Charm! Bring Your Horses And Pets!! "Tenuta il Galletto Charming country house in Monferrato"
Property 78: "Tenuta il Galletto Charming country house in Monferrato"
Elegant house in the hills of Monferrato, UNESCO heritage! Property 79: Elegant house in the hills of Monferrato, UNESCO heritage! The property is a beautiful, old, refurbished country home owned and operated by a lovely family who was welcoming, accommodating and just really nice. It is divided into three separate apartments, which was perfect for our party of thirteen people. Each apartment has its own bathroom and kitchen, and there is also a communal kitchen and dining room (as well as separate bathrooms) where large parties can cook and eat together. The pool was just the right size for my two young daughters who took the opportunity to teach themselves how to swim! The house rests on a hill overlooking a northern Italian countryside adorned with vineyards and other vegetation as far as the eye can see. It is a few kilometers (5 minutes by car) away from the towns of Calosso and Santo Stefano Belbo, the latter of which is a lovely little town with a supermarket, a charming enoteca and some small bars run by super friendly people. Also, if you are willing to drive about thirty or forty minutes, you can visit larger towns like La Morra and Nizza. Overall, we had a fantastic week, and I cannot say enough about the facilities and the hospitality of Roberta, Beppe and their family. The house was clean, well-stocked with supplies such as dishes, glasses, etc., and there was always someone there to help us if we had questions (it does help if you know a little Italian, though). Again, it was ideal for our party, and I would highly recommend it for people who really want to get away from the hustle and bustle of everyday modern life and enjoy a charming, &quot;old school&quot; vacation experience.